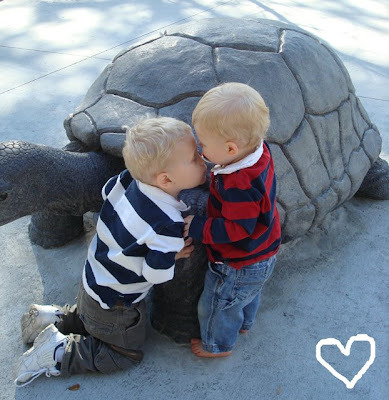 April's Little Family: Zoo Love. p.s. More Wednesday pictures here. That is too cute. Aw. Aww that is so sweet! Oh, that's so sweet! Good capture. Oh goodness that is just the sweetest! Save it for when they are fighting later!! Oh that is one of the sweetest pictures ever. It's got to go in a frame- a definite keeper! I do so love the brother love! oh that is just so sweet. I am been trying to capture my kids doing this but have not yet. That is a truely adorable picture. It looks professional. Oh my GOD that's CUUUTE! Now you have proof that they CAN be sweet to each other! Just stopping by via SITS to say "Hello"! I love your photo. It's so cute! I found your blog on Moms in a Blog and thought you'd might like to join in on the fun over at I Heart Faces. It's a photography contest and it's lots of fun. Your photos so sweet. Hope to see you there. Hi there! OMG, they are just so cute...as always. I loved the birthday collage too. Sweetie-pies! Visiting from SITS. It is so cool you were able to capture this!